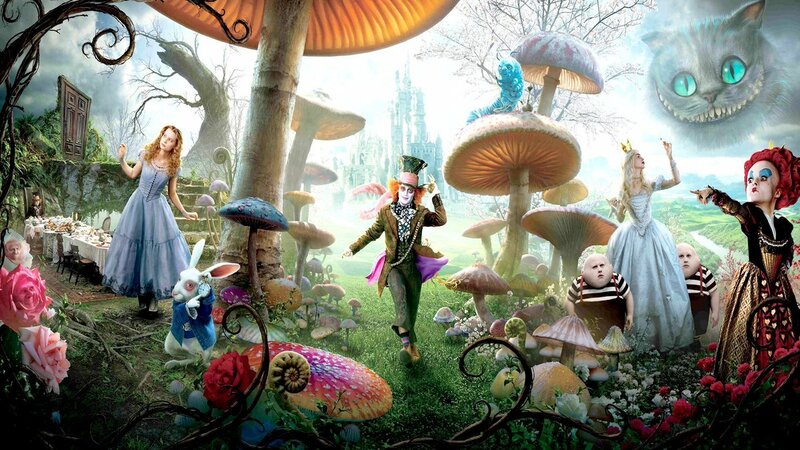 If you feel as though you are walking through an Alice in Wonderland film set, you are probably not alone. It appears “Out of sample” market experiences are proliferating across many market measures. I believe this “out of sample” experience is the direct result of conflict between two massive forces colliding at an accelerating rate. The natural organic development of markets, and unprecedented interventions from policy makers. Objectively, it can be shown that this is exactly what is happening. 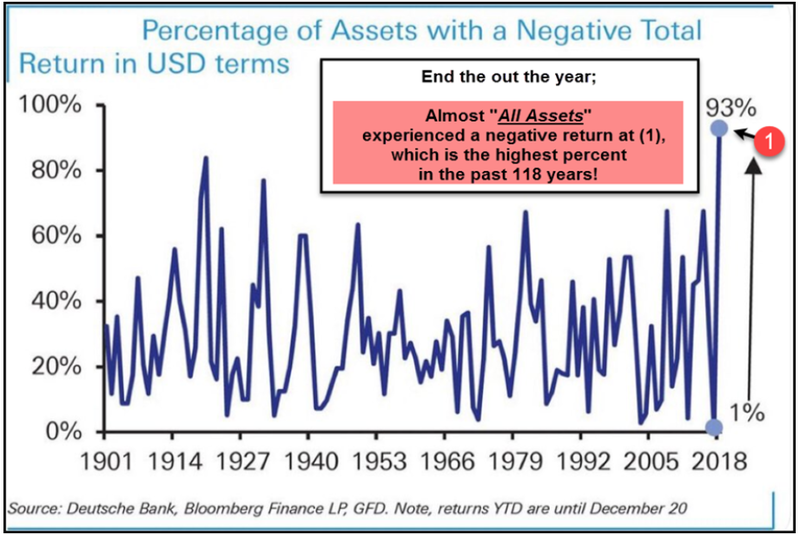 The chart below shows that returns across all assets over the last 120 years have experienced both the best and worst extremes in performance just in the last year or so. 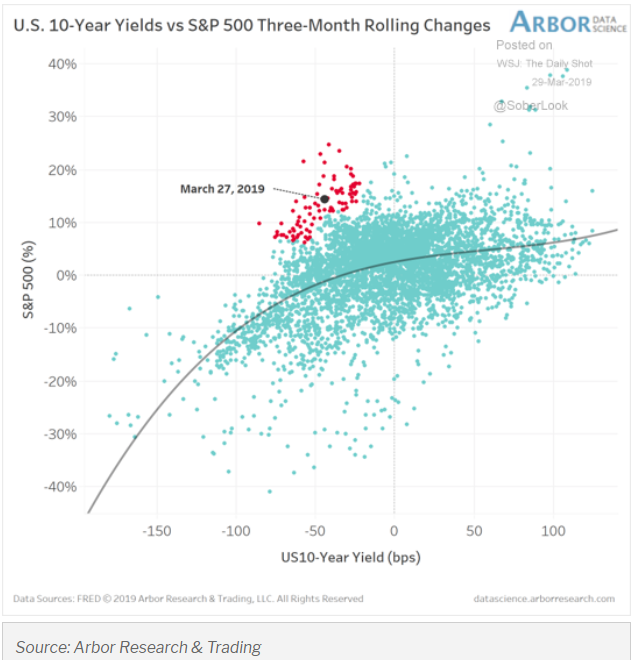 In Q1 2019 the variation in US government bonds relative to US equities was also “out of sample”. Government bond yields have never fallen this much, while the S&P 500 rallied this much. Government bonds yields fell naturally as world growth collapsed to the lowest level since 2008 (see below). US stocks rallied as intervention and policy changes came to the rescue of the stock market. It seems that as interventions and policy changes have begun to fail, they have to become increasingly more violent. Failing Central Banks. Strategic Risk And Investment Plan Review Essential. Today the market’s focus is heavily concentrated on the Federal Reserve’s every utterance and every possible interpretation. Rightly so. The Federal Reserve has dominated markets ever since 2008. “The bull market of the past decade since the Great Recession has been an unusual one: despite all of the economic damage that occurred during the global financial crisis and rising risks (including global debt rising by $75 trillion), it has been the longest bull market in history. 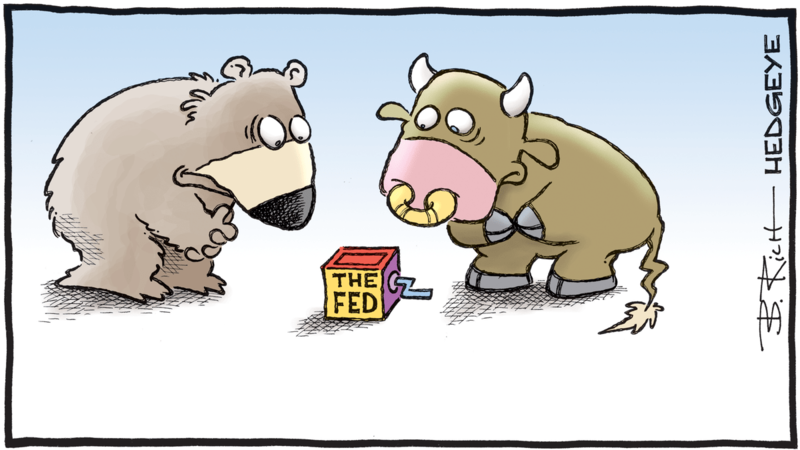 The explanation for this paradox is simple: it’s not an organic bull market because the Fed and other central banks keep stepping in to prop up the market every time it stumbles. Though the Fed has two official mandates (maintaining stable consumer prices and maximizing employment), it has taken on the unofficial third mandate of supporting and boosting the stock market since the Great Recession. 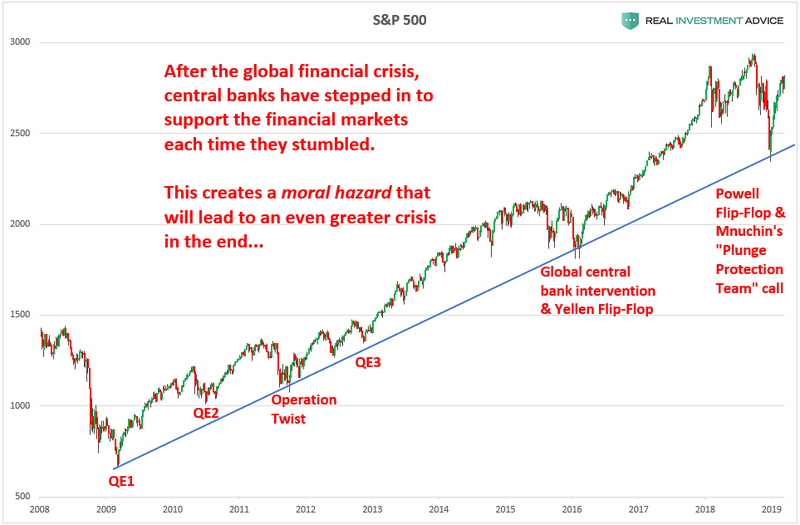 The deeper the central banks have gone into this “unofficial third mandate of supporting and boosting the stock market” the more trapped the central banks are, in what now could be described as the biggest US stock market bubble in history. 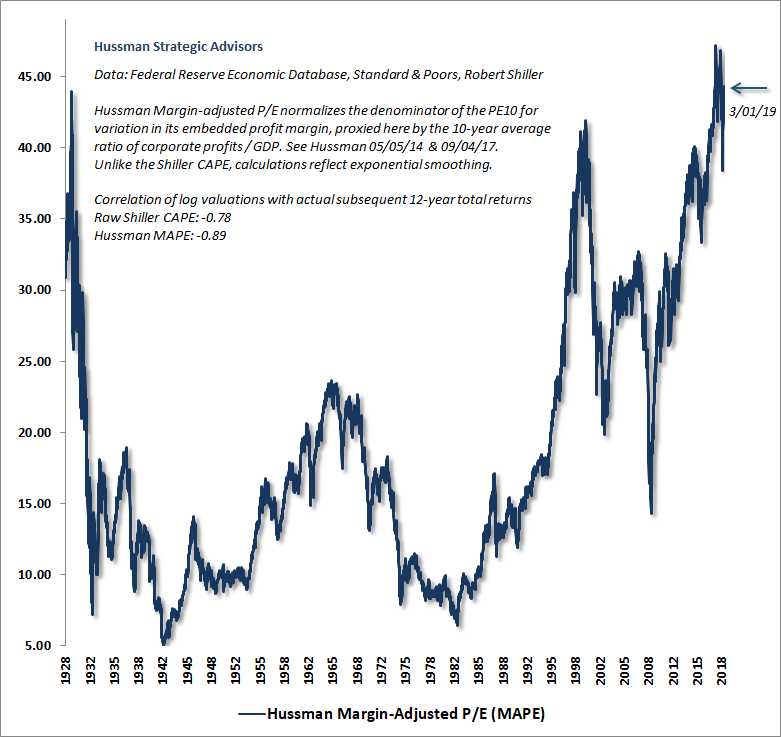 Here is a chart of the valuation metric that correlates most closely with actual subsequent long term US Equity market returns. Currently, the 90 year track record of this measure, shown below, estimates the 12 year nominal expected return on the S&P 500 will be around MINUS 1%. Let’s call that a bubble. In addition to this long term risk, the world economy is now at its weakest since 2008. Not really much support for the highest US equity valuations in history. This overvaluation has been well disguised as after tax earnings have been boosted by tax cuts, buybacks, and other adjustments. 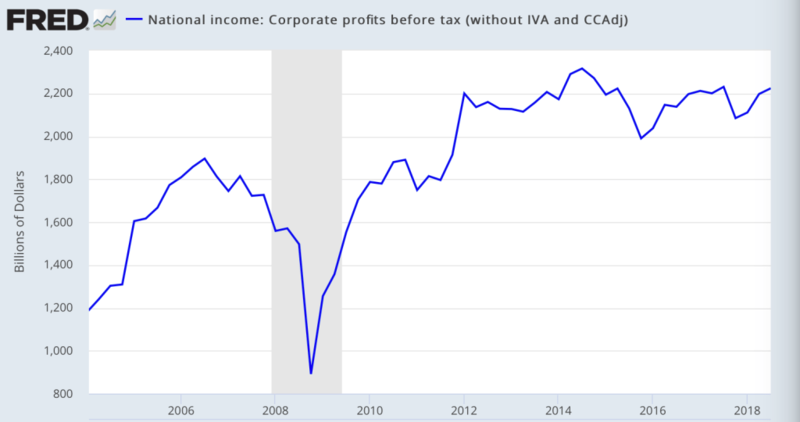 A cleaner view of core earnings comes from pre-tax earnings, which are broadly unchanged since 2012. No real “organic” support for US equities here. Perhaps the most absurd central bank distortion of all is in negative interest rates. With the turn down in the world economy bonds are rallying again and the amount of negative yielding bonds is growing again back to $10 Trillion! This is the amount of capital that is now committed to a guaranteed long term negative return! Can Central Bank distortions continue for ever? Or are we reaching the limits? After 10 years of heavy intervention from central banks, many US investors now seem anchored to the idea that these bizarre market extremes are eternal. However, it is important not to ignore the growing impotence of most other central banks, who have not been able to manipulate equity markets with the same success, even with their new negative interest rate invention, untried for around 5,000 years as best as I can tell. 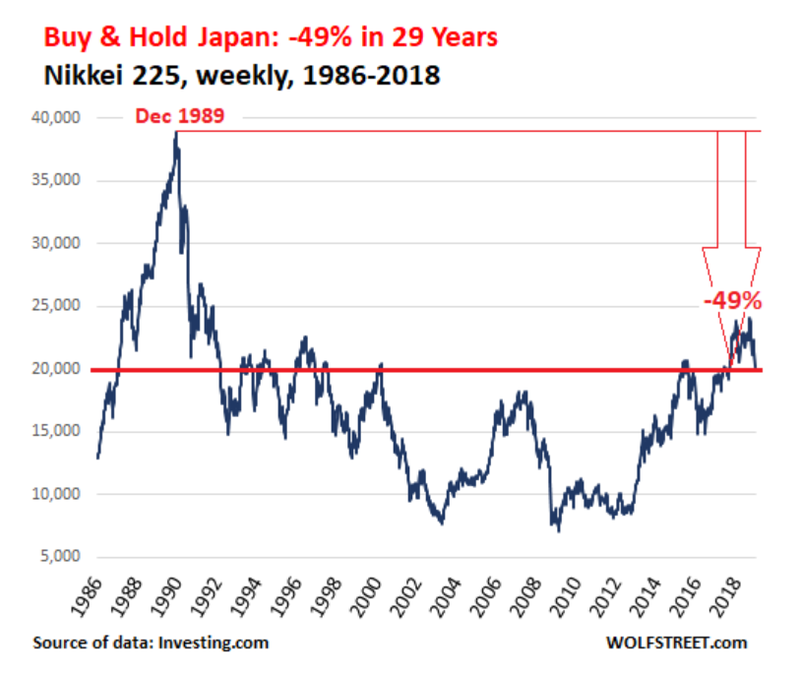 In the case of Japan, central bank intervention has been legendary and yet the Japanese stock market is still down around 50% from where it was 30 years ago! The European experience is similar. 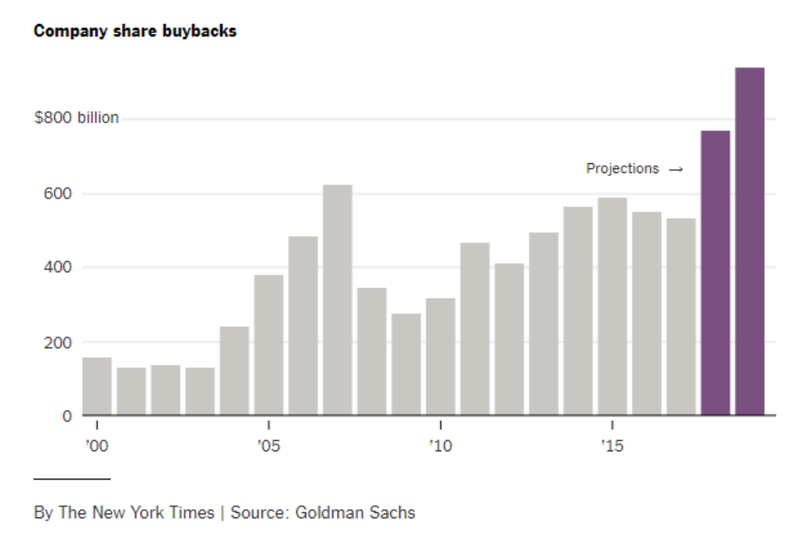 Buybacks seem to have been more effective in supporting the US stock market, and are exploding higher. There are, of course, natural limits to buybacks. Corporate balance sheets can only get leveraged so far before companies put themselves at risk. I believe we are clearly close to that point. 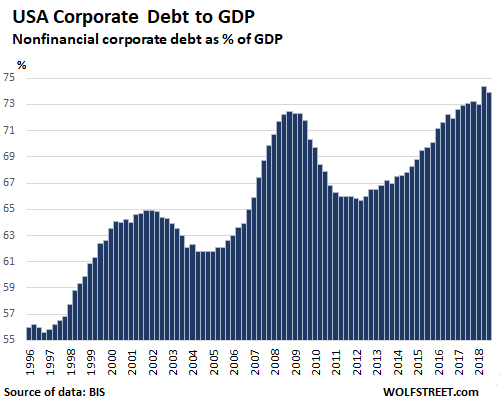 Corporate debt in the US and around the world is reaching record levels. Compared to previous bubbles corporate balance sheets are already stretched beyond prior record levels. 1. The highest long term valuations in history. 2. The lowest 12 year expected returns in history at MINUS 1% in nominal terms, in other words, not allowing for inflation or tax. 3. The failure of even negative interest rates to boost growth or inflation in either Japan or Germany. 4. The failure of ever expanding government debt and central bank asset purchases to boost growth or inflation in either Japan or Europe. 5. Buybacks are reaching their limit as corporate debt reaches new extremes. 6. 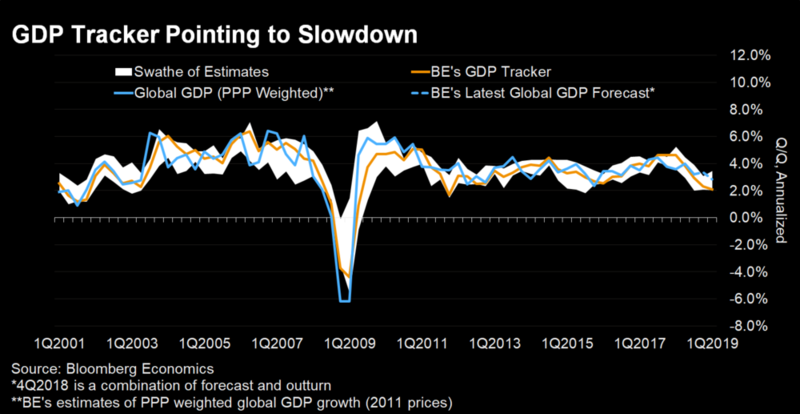 The weakest growth in the world economy since 2008. 7. 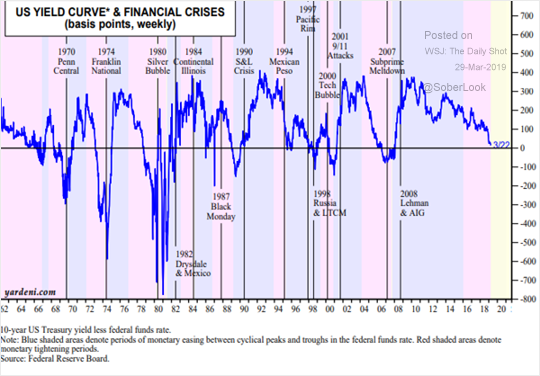 The extreme flattening of the US yield curve that has preceded almost all financial crises since 1952. 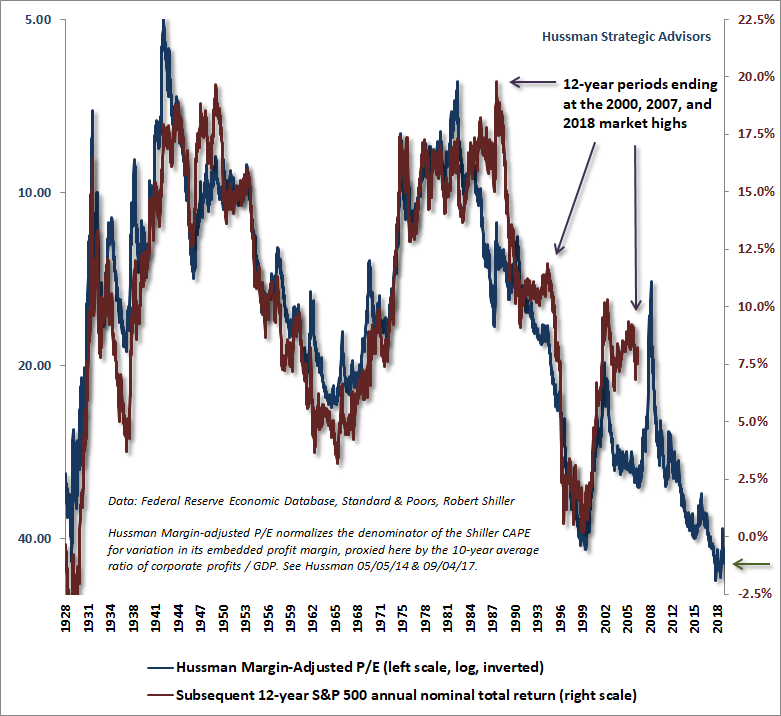 Essentially you must have remarkable faith in the Fed and buybacks, even though both factors have now become extremely challenged at a time when US equities are at the highest valuations in history. The policy challenge to keep the US from a recession is building. Richard Duncan summarizes this well. “Between 1980 and 2008, Credit Growth drove Economic Growth. The ratio of Total Credit to GDP soared from 170% in 1980 to 370% in 2008. Since 2008, however, Credit Growth has been too weak to make the economy expand. Rising asset prices have taken over as the new growth driver. Richard Duncan describes a reasonable outlook for policy over the next year. Investors should be aware that this would still only place the US in the same trap that Japan and Europe are in. The key factor in any strategy is the risk assessment. 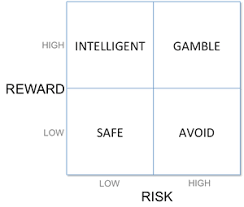 Investors should know where their investments are in the return to risk grid below. The same portfolio of the last 10 years does not stay in the same part of this grid as macro conditions, prices and valuations are changing all the time. In my opinion a long term allocation to a “long only” US equity strategy is now, as clearly as it can be, in the AVOID box. The risk is extraordinarily high, and the long term reward is negative in nominal terms. Investors, in particular retirement investors, need a better strategy. 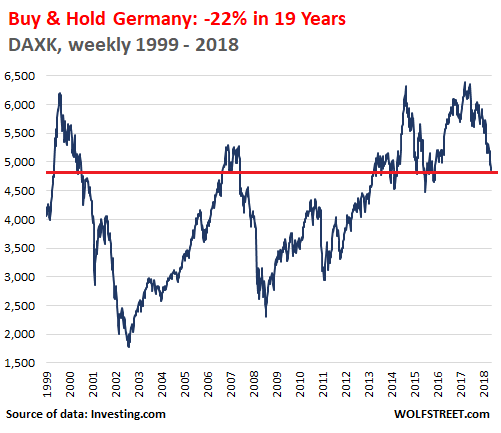 Too many US equity investors have become anchored to the extraordinary interventions that have unnaturally elevated US equities to the highest valuations in history. This should be regarded as a windfall gain, not as a permanent wealth creation strategy. With the drivers of these unprecedented conditions now exhausted, it has become an urgent matter to review strategy. Investment advice is offered through Belpointe Asset Management, LLC, 125 Greenwich Avenue, Greenwich, CT 06830 (“Belpointe”). Important information and disclosures related to Belpointe are available at http://www.belpointe.com. Additional information pertaining to Chris Belchamber and/or Belpointe’s registration status, its business operations, services and fees and its current written disclosure statement is available on the SEC’s Investment Adviser public website athttps://www.adviserinfo.sec.gov/. The information provided herein is educational in nature and not designed to be a recommendation for any specific investment product, strategy, plan feature or other purposes. Accordingly, it should not be construed by any consumer and/or prospective client as solicitation to effect, or attempt to effect transactions in securities, or the rendering of personalized investment advice for compensation. CB Investment Management and/or Chris Belchamber are not an attorney or a tax professional and the information contained herein should not be considered tax or accounting advice, legal or regulatory advice. This material is not suggesting a specific course of action or any action at all. Communications such as this are not impartial and are provided in connection with advertising and marketing. Prior to making any investment or financial decisions, an investor should seek individualized advice from a personal financial, legal, tax and other professional advisors that take into account all of the particular facts and circumstances of an investor’s own situation.